Is the Web Destroying the Cultural Economy? Will China's Currency Peg Be the Next to Fall? 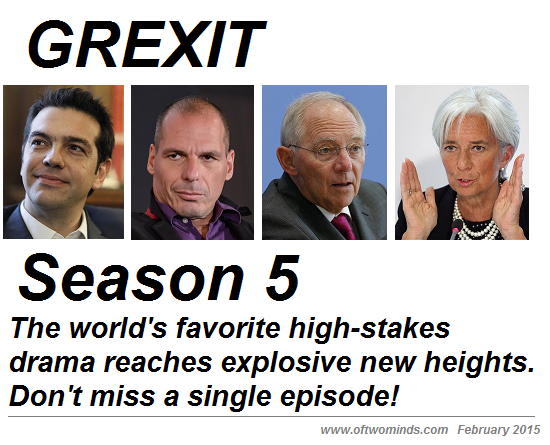 Season 5 of the popular drama GREXIT is now in production. The political-financial drama Grexit was greenlighted for a 5th season, as new characters and new narratives have reinvigorated a series that was clearly flagging in mid-2014. Given the sleepy subplots that dominated the 2014 series, industry insiders were anticipating a cancellation. But with the introduction of new leads Alexis Tsipras and Yanis Varoufakis, veteran cast members Wolfgang Schäuble and Christine Lagarde must now grapple with a new field of canny adversaries and new obstacles. "It's no secret the first two seasons in 2011 and 2012 were spectacular," One industry veteran told us. "It was one cliffhanger after another. 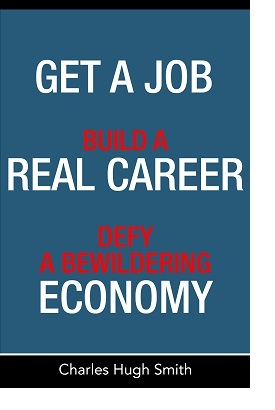 But the last two seasons went downhill. Austerity just isn't that compelling, and the subplots that made the first two seasons so enjoyable lost their narrative edge." When the authenticity of Christine Largarde's sun-kissed tan became a plot point, sources reckoned the series had exhausted itself. Suddenly, a veritable cornucopia of emotionally gripping narratives have emerged: old vendettas from World War II, the underdog Greeks versus the German oppressors, the responsible Germans versus the profligate Greeks, the slim margin of victory held by the new team of Tsipras and Varoufakis, and numerous subplots as the Troika leaders make public announcements while wheeling and dealing behind closed doors. "It boils down to 'will they or won't they' (leave the euro), but like all relationship dramas, the fun is in the personal battles and the plot twists," the industry veteran explained. "From what I hear, the season finale is still very much up in the air." The series' ratings, which had eroded steadily through 2013 and 2014, have soared in 2015, and everyone involved with the series is newly energized. One cast member spoke with us confidentially. "The great draw of Grexit is the Rashomon-like nature of the story. Each protagonist is the villain to half the audience and a hero to the other half. There are multiple love-hate relationships simmering in each episode." One of the production team noted the new season's dramatic turns occupy the world stage. "Though Greece has a limited role in Europe, and is a bit player globally in terms of population and GDP, it's managed to secure a global spotlight on center stage with the drama of Grexit. This goes to show the power of a good conflict with strong characters facing multiple obstacles and plot twists." Though there had been rumors of a two-year extension, recent gossip has this season's finale ending the series in a high-stakes showdown. Insiders would neither confirm nor deny the rumor, but they promised a "show unlike any other" this season. Thank you, Kenneth C. ($60), for your stupendously generous contribution to this site-- I am greatly honored by your steadfast support and readership.